Dorry Segev and Sommer Gentry dance and teach 1940s Smooth Style Lindy Hop, Collegiate Shag, and Balboa. They love fast, upbeat music and fancy footwork. They have been dancing together all millenium and have competed and performed all over the world for audiences of thousands. They met dancing, and on October 18th, 2003, they were married in Ventura, CA. In 2006 they placed for the fourth time in the American Championships (watch the video!) and in 2002, while living abroad, they won the 2002 UK Championships. In 2005, Dorry & Sommer started Charm City Swing, the swing dance community in Baltimore, to introduce non-dancers to what we all do and love! The community has grown to a huge level, thanks to our recent awesome partners Nina and Michael and all of the dancers in Baltimore who bring so much energy, time, and spirit to the dance. Our Monday Night was even named Baltimore's Best Reason to Go Out on a Monday Night by Baltimore Magazine's Best of Baltimore! 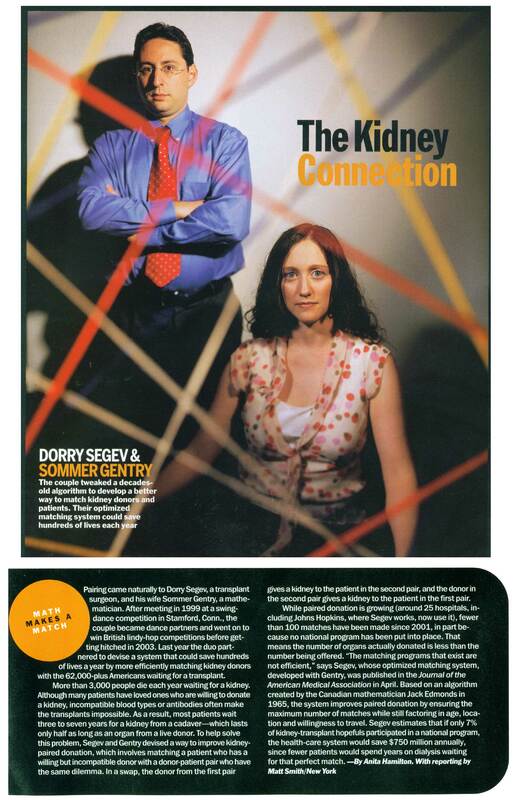 When they're not dancing, Dorry and Sommer do research together. You can read about them in TIME magazine (September 12, 2005 issue, "Innovators") or Reader's Digest (March 2006). A recent story in the Baltimore Sun Magazine tells their story nicely. Also, Dorry does some dance and street photography, some of which has been published.